Back in September I was asked by the Shrimp Council to be a part of the 12 days of holiday bloggers. They asked for a favorite holiday memory and a shrimp recipe to share. Today I’m excited to be the featured blogger over at the Eat Shrimp facebook page!! If you click the window number 5, you’ll see me. So cool!! Hopefully you’ve been too busy to notice that I slipped off the bloggy radar a bit lately….oops! But that doesn’t mean I haven’t been busy in the kitchen. After Thanksgiving, the leftovers were put to good use and I enjoyed several turkey cranberry walnut salads and our favorite turkey stuffing sandwich. My mother-in-law even made a turkey pot pie! All of the breading did not agree with me…I’m not used to so much white flour, and I was happy to get back to salads, and took several walks in the fresh air. We enjoyed many evenings with temperatures perfect in the low to mid 60’s, but unfortunately it’s been unseasonably warm this year. I’m so excited we are dipping into the 50’s tonight! I’m ready for some more snuggle weather!! Yesterday was hubby’s birthday and he likes to keep it low key. Really….are there any men out there that like announcing their birthdays? Or that they’re another year older? If so, please tell me. I feel like he almost cringes when the girls say, “Happy Birthday, Daddy!” But I do think it was his best birthday in a long time now that he’s in business for himself. We’ve gotten a few clients now, and things are really picking up. It’s exciting for both of us! We’re really looking forward to what the new year brings! I created this shrimp recipe over 5 or 6 years ago. Hubby and I both like spicy, and this is now a favorite of our girls as well. Hope it’s a nice change of pace for you with all these holiday and dessert posts out in cyberspace. I definitely have several of our favorite treats and recipes to share with you this month….so make sure to keep popping in. The halls are decked here, and my older girls are in their first play tomorrow night, “A Christmas Carol” put on by our homeschool group. I’m excited to see many weeks of hard work take shape, and they are too! An easy spicy sprimp dish the whole family loves! In a skillet, saute scallions, thyme, basil, pepper and cayenne pepper in olive oil for about 5 minutes. Add in minced garlic, chicken stock, sugar, worchestershire sauce, hot sauce and mix thoroughly over low to medium heat. Stir in cream cheese and cream or milk, blend well and continue cooking over low heat till it thickens (approx. 30 minutes). While sauce is cooking, saute shrimp in some butter until almost cooked (pink, but not totally opaque). Add shrimp to sauce and cook for another few minutes. Add in the cooked pasta and parmesan cheese. Sounds like a winner to me! I love anything with pasta and shrimp! This recipe sounds fantasic. I love shrimp and pasta together! The fact that it’s spicy is a huge plus. I’m going to try this one for sure…..thanks for the post. Gorgeous photo. I love pasta with shrimp. It is always a challenge to serve something new every Holidays. The delight and surprises in my family’s faces is fulfilling. 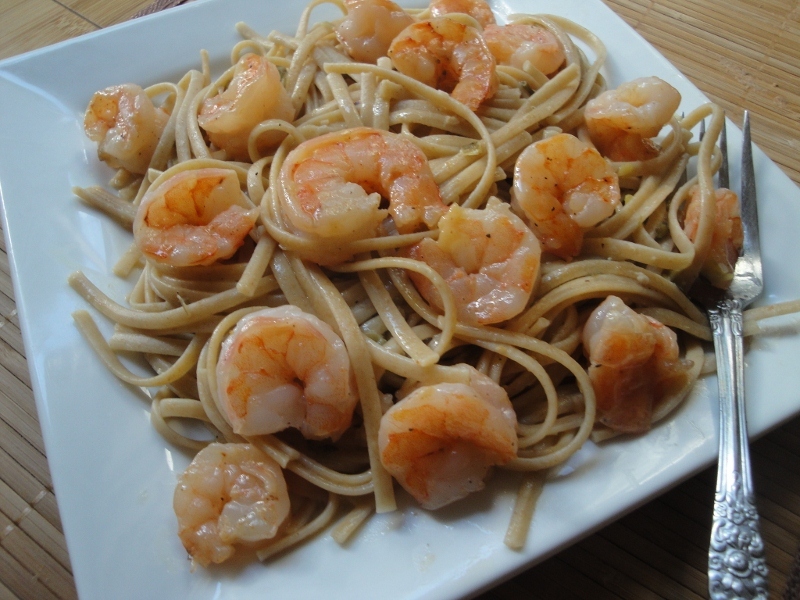 Your Cajun shrimp pasta sounds like a great idea and I can’t wait how it will turn out. Hope you can visit here as well. Thank you for sharing this amazing recipe. I love how the shrimps match perfectly with the pasta. I will enjoy making these for my love ones this Christmas. I love the ingredients selection. I can already imagine how tasty this pasta will be.